The Crochet Crowd is Officially Mobile. Use it on Android, Apple or Tablet Devices. We’ve officially moved into the era of being in your pocket / purse. 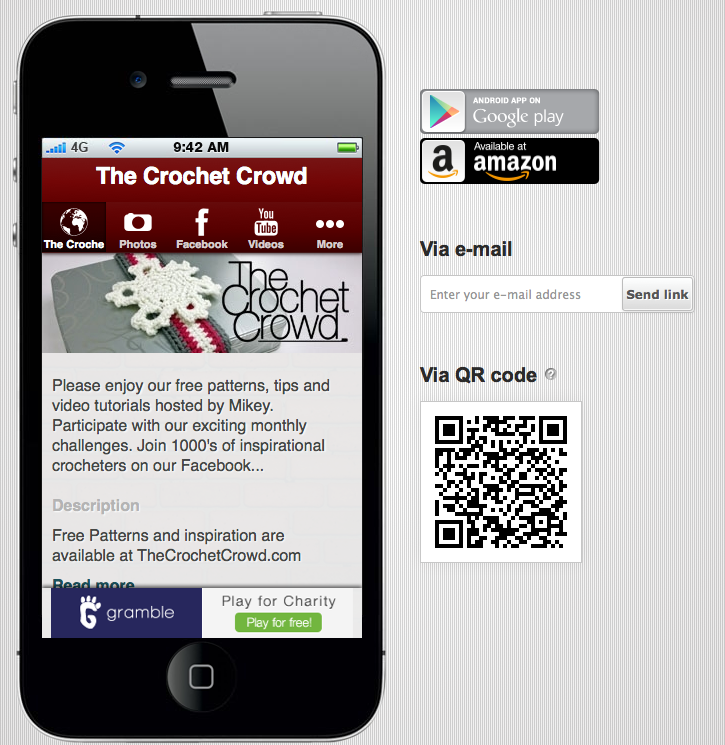 The New Crochet Crowd App is officially launched. Be one of the first to try our new APP. We’ve been waiting a long time to have our own APP. This puts our community directly into your pocket. Let me tell you about some of the features. To keep our community connected, our Facebook section will have the latest comments, including our own, in chronological order. This means when you look at our Facebook, it’s not just Cathy and I yacking at ya. It’s the latest posts from our entire community. Our YouTube Videos are connected to the APP. It’s in order of the latest released videos. It will play directly on our APP as well. Photos are from ourselves that we share on Facebook. We are looking to change this in the future to be the latest photos from our community through Flickr. In the More Section, you will find updates from my blog. You will also find a direct link to our Website, events and patterns. This APP officially works on Apple, Tablet and Android Devices. Whether you have a phone or a iPad. It’s a generic APP that spans the entire base. Click Here to Bring Up Our Welcome Page. You will see the bar code and email box. You can either scan our QR CODE to open our APP OR Enter in your email to have the code forwarded to your email. When you get the screen opened or click to install the APP through your email. It will prompt you to add our app to your Home Screen. I have future plans for this APP for bringing you more great content and resource materials. This is a great start for now. Your feedback is very much appreciated. This entry was posted in Announcements and tagged Android, APP, Apple, Craft, Crochet, crochet crowd, Facebook, Mikey, Mobile, Phone, YouTube. Bookmark the permalink. I successfully added this to my iPhone! It was seamless!! Thanks for making the Crochet Crowd accessible from anywhere I am! Keep up the good work! Love you all!